El espacio...la Frontera Final. Estos son los viajes de la nave estelar Notebookcheck durante su misión de explorar la (Samsung) Galaxy S5. La tripulación espera un resultado de otro mundo - y aunque las puntuaciones se quedan algo cortas para lo que esperábamos, el S5 no obstante se lleva la corona de los smartphone. Featuring a reworked, more luxurious design, improved screen, next-generation octa-core processor and significantly cleaner TouchWiz skin, the Galaxy S6 is the best smartphone ever released by Samsung. However, with the Galaxy S5's price close to halved since the Galaxy S6's launch, and the 2014 handset still offering above average performance and specifications at the price point, buyers on a budget would still do well to consider the older phone. The HTC One M9 is a beautifully crafted handset, next to which Samsung's Galaxy S5 looks quite average, not to mention the aesthetic appeal of Sense 7 over the TouchWiz interface. On paper the HTC beast has every reason to feel superior, too, with a much faster chipset, stereo speakers, and higher camera resolutions. In reality, however, the situation is more nuanced. We've yet to run the Samsung Galaxy S6 through our benchmarks, but on paper it sounds as though it should be significantly faster than the Galaxy S5. It also has a beautiful Quad HD screen that's significantly higher in resolution and much brighter than that on the S5. The new Galaxy shows a vast improvement in design, too, and there are some nice upgrades to the camera - particularly at the front. Some sacrifices have been made, though, with the S6 losing the removable battery and microSD card slot that have long been favoured by Samsung fans. The Galaxy S5 is most definitely a mixed bag. On the one hand, the disgruntlement regarding the exterior design is entirely understandable; not only is it not the advancement many expected, it’s actually a bit of a step back with that revolting back cover. But when you boil it all down that’s one of only a small number of bad things I have to say about it. On the whole this is actually a pretty great smartphone. It’s fast and powerful with stacks of storage space and connectivity options, and the screen is gorgeous. The waterproofing is a real boon too, as you don’t have to worry about Tweeting from your bathtub. The Samsung Galaxy S5 does a lot of things well. Its Super AMOLED display offers stunning visuals, while its Snapdragon 801 CPU delivers strong performance. Features such as S Health continue to grow, becoming more useful, despite a gimmicky heartbeat monitor. And let's not forget the more than 9 hours of battery life that can be extended even further. Coming to the end of our review, the Galaxy Note 4 is the clear winner having won five rounds to the Galaxy S5's two. While the Galaxy Note 4's increased size won't be to everyone's taste, an improved rear camera, more powerful processor and productivity focused S Pen stylus make the phablet one of the best Android phones currently available to enterprises. Here in the US, consumers can pick up both smartphones through AT&T for the 2-year contract price of $200. Somewhat of a strange decision to say quite frankly, it’s tough to recommend handing over the cash to pick up the Galaxy Alpha. Yes, it’s certainly gorgeous looking, but the same amount will land you the more features rich Galaxy S5 – not to mention it’s also better spec’d, offers a water resistant property with its construction, and performs better in a variety of areas over its sibling. The Galaxy Note 4 and Galaxy S5 are devices of different size and there’s no going around that: the phablet-sized Note 4 is not among the thinnest devices out there and its heft is felt at that large size. In return, it will reward you with one of the best Android experiences out there starting with the brilliant, 5.7-inch Quad HD display, the latest Snapdragon 805 system chip that scores at the top of the Android ranks, and an improved camera with optical stabilization. With a more stylish — and far more customizable — design, better performance, more-useful features and a lower price, the Moto X just edges out the Samsung Galaxy S5 in this nine-round competition. The S5 kept things competitive, though, winning many crucial rounds, including display, interface, camera and battery life. So, regardless of which phone you choose, you'll end up a winner. There’s a reason why the Samsung Galaxy S5 continues to be a noteworthy smartphone, despite the fact that it’s been out for some time now. Frankly, it just works in being a high performing smartphone – one that’s usually a top finisher in key categories. From its superior battery life, sharp camera quality, and its rich set of software features, the Galaxy S5 is without a doubt a few steps ahead of the Moto X. Arriving a good six months after the Samsung Galaxy S5, it's no surprise that the Samsung Galaxy Note 4 has significantly faster hardware. It's important to note, however, that all flagship smartphones are now very fast, and the chances of the average user being able to tell the difference between them is minimal. However, what might sway you in the new Note's favour is its larger, higher-resolution screen and potentially longer battery life. Whether it sways you enough to part with an extra £200 over the S5 will depend on your budget. The Galaxy S5 mini has the usual downgrades compared to the full-size Galaxy S5 including screen resolution, camera and processor. It has the same design, including IP67 certification, in a more compact device while retaining the fingerprint scanner and heart rate monitor. We await a UK release date and price. Having won five rounds to the Galaxy S5's three, the LG G3 is the winner of this versus review. Featuring a superior screen, better camera and more innovative design the G3 is one of, if not the best Android smartphone currently available. 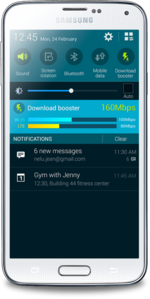 But with a better battery life and more robust portfolio of security services there is still plenty to like about the Galaxy S5. 90% Samsung goes for evolution over revolution... again. The Samsung Galaxy S5 is a great phone - the problem is we're now in a world where stunning smartphones are becoming the norm. Samsung seems to banking on the fact it knows there will be some people out there who will buy its devices no matter what, else it would have jumped to a more premium design. If you're a Samsung fan, this is the phone you should buy without question. If you're more agnostic, there's better out there. The gamble that LG took with the G3 this could ultimately end up paying off, but past trends indicate that the Samsung has responded well to challenges from its rivals. But until that time comes, the unmatched screen, the excellent camera, and compelling design make the G3 a tough one to beat, despite its shortcomings. The Korean derby will only be getting more interesting to watch. That's for sure. Not everyone will end up choosing a side - but many will be tempted. This is a very nice Smartphone and I am sure Samsung have another winner with it, easy to use and learn, the screen is not very reflective so does not show fingermarks and the creamy white surround shows nothing. It even has possible fingerprint scanning security but this was one of the many things I could not test in the available time. Mirrorcasting out of the box was another. The Galaxy S5 is Samsung’s flagship handset and is probably the best Android smartphone on the market right now. HTC’s One (M8) is a great looking phone let down by its camera, while Sony’s Xperia Z2 is a touch on the big side. If size doesn’t bother you, the Xperia X2 reportedly boasts the best camera and video performance of any waterproof smartphone. We'd happily own either of these two similarly specified smartphones, but with just a few pounds between them the LG G3 looks to be the more impressive device. Whereas the S5 offers a fingerprint reader and heart-rate sensor, the G3 boasts a larger, significantly higher-resolution Quad HD display that is quite simply beautiful, plus support for high-resolution audio. We'd much rather watch video, view photos and play games on the G3, which should be every bit as fast as the Galaxy S5. Things haven't changed much from the Galaxy S4 but Samsung, as usual, has packed the Galaxy S5 with features. However, a lot are somewhat unnecessary. The heart rate monitor is a prime example and while the fingerprint scanner is cool, it's difficult to use. There is some top end hardware here, particularly the screen, but nothing which stands out in a busy and competitive market. A key element is that the design of the Galaxy S5 falls short. It's plastic, looks like every other Samsung handset and doesn't feel premium. Galaxy S4 users needn't upgrade and anyone looking for a flagship smartphone can get better elsewhere. Samsung has done a good job with the Galaxy S5. Software bloat has been pared down and a few useful new features added, while the technical specifications are superb and battery life is good. Design purists may bemoan the plastic chassis, but the Galaxy S5 is still a worthy successor to last year's model. The Samsung Galaxy S5 is a well refined piece of hardware; it’s not a game-breaking, revolutionary device that blows the its predecessor or the competition out of the water, but Samsung has made a number of welcome improvements in key areas and sometimes that's just what we need in annual updates. 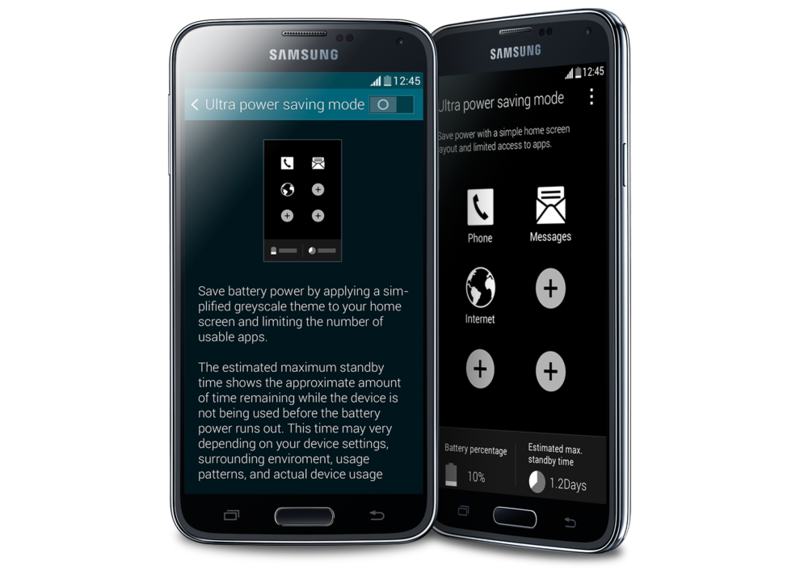 At the end of the day, the Samsung Galaxy S5 is a fine flagship smartphone that meets most criteria. Many refinements to the formula are great, others not so much, but the overall package is one that users should generally like and enjoy to use, current S4 owners included. Things haven't changed much from the Galaxy S4 but Samsung, as usual, has packed the Galaxy S5 with features. However, a lot are somewhat unnecessary. The heart rate monitor is a prime example and while the fingerprint scanner is cool, it's difficult to use. There is some top end hardware here, particularly the screen, but nothing which stands out in a busy and competitive market. A key element is that the design of the Galaxy S5 falls short. It's plastic, looks like every other Samsung handset and doesn't feel premium. Galaxy S4 users needn’t upgrade and anyone looking for a flagship smartphone can get better elsewhere. People will look to the Galaxy S5 for a fresh take on an amazing smartphone and they will be misguided to do so. It would be wiser to focus on what the S5 offers -- tons of enhancements and fixes for most of the things that people complain about with their smartphones. The camera is noticeably clearer, the battery life is remarkably better, the screen is brighter and has better colors, and the body of the phone undoubtedly better. This is exactly what people wanted, and Samsung delivered on the core attributes of what makes a great phone. If you're looking for a phone to shake the smartphone paradigm, look elsewhere. If you want a phone that does the important things well and throws in a few bonuses a long the way, Samsung has made its best Android phone yet, and it's ready to meet those needs. The Samsung Galaxy S5 is surely an upgrade over the Galaxy S5 is almost every single way- better screen, better camera, longer lasting battery and a faster processor. That being said, I think the Galaxy S4 continues to be a great phone, especially after the KitKat update. 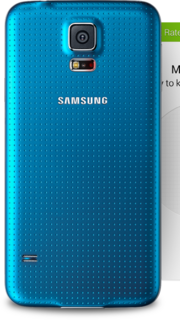 So if you already own the S4, I wouldn’t necessarily rush out to buy the S5. However, if you have anything older and are looking to upgrade I would definitely suggest going down to the store and playing with the Galaxy S5. And I wouldn’t be surprised if you walk out with one. We've occasionally passed out Editor's Choice awards here when there are multiple devices in a category that we feel are worthy. In the case of Samsung's Galaxy S5, it goes without question on the team, that this device deserves this level of praise, as does HTC's One (M8). Some people will find themselves drawn to the One's fantastic exterior design quality, while others will lean towards the GS5's beautiful S-AMOLED display and unique, powerful feature set. With its gorgeous display, powerful Snapdragon 801 processor and enhanced camera, the Samsung Galaxy S5 easily eclipses its predecessor along with nearly all other smartphones on the market. 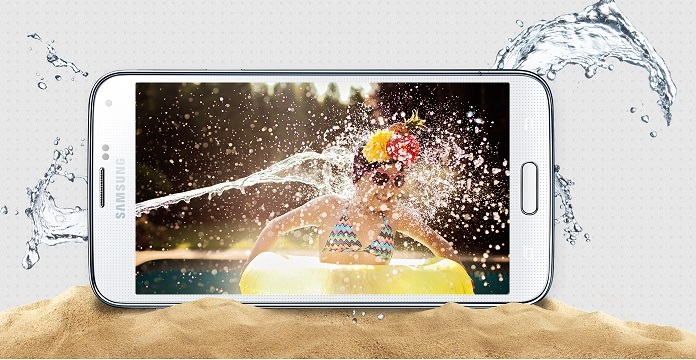 Oh, and let's not forget the fact that the S5 can go for a quick dip and keep on kicking. Plus, the T-Mobile S5 lasts nearly 11 hours on a charge, longer than the carrier models we tested. The Galaxy S5 does incorporate new features like water and dust resistance, a heart rate monitor and a fingerprint scanner, but the area where it loses is its design. Samsung has not done enough to make the Galaxy S5 a desirable premium smartphone.There is no compromise on performance though but we really wished that the Samsung would overhaul the build and design of its smartphones. The Galaxy S5 is an expensive phone, so for most users it'll be a two-year deal. Being locked in with any device for that long is likely to be unpleasant. I can't promise Samsung will keep the GS5 up to date for the entire time, or even that it will get the next major OS update in a timely fashion. That's just the risk you take with a non-Nexus Android phone. Still, the device Samsung has released is excellent, and it's definitely worthy of being on your shortlist. There’s a good reason why the Samsung Galaxy S5 is so popular. Underneath the high price and plastic body lies a very good smartphone that has come a long way from the initial days of the Galaxy S. Compared to its predecessor, the S5 is an evolutionary upgrade just like the HTC One M8 or the Sony Xperia Z2 are to their counterparts. While many will be put off with yet another plastic phone from Samsung, we don’t think they had much of a choice given the new features that are present. 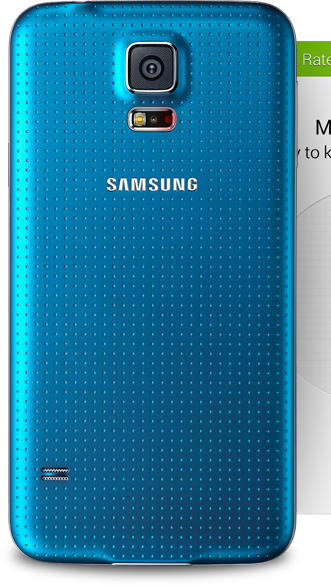 It’s certainly not a premium looking phone but I guess that’s the compromise Samsung has had to make. I do think they could have done a better job with polycarbonate though. Just look at what HTC did with the One X or Nokia with the Lumia 1520. The Samsung Galaxy S5 is by all means a perfectly good smartphone. This isn’t a major reinvention of the previous year’s model, though. While the display is out-of-this-world good, the rest just sort of feels somewhat unremarkable. The camera is good, not ground-breaking. The water resistance is nice, but nothing new to phones. Battery life is acceptable, not DROID MAXX-like. TouchWiz’s design has changed for the better, but still causes too much phone lag. And the whole phone design feels extremely dated and out-of-touch. This just isn’t the phone for me (or Tim it sounds like). I want more than just a beautiful display. I don’t want all that bezel or size. I don’t want a physical home button or TouchWiz’s lag or all that bloatware. I would take the camera, but others have capable cameras. Where is that thing, that is trying to draw me in? Maybe there isn’t supposed to be one? Or maybe it’s coming in the rumored premium version of the Galaxy S5 later this year. Or maybe it will be here in the Galaxy S6. Who’s the Galaxy S5 for, then? Probably not for Galaxy S4 owners, for whom the hardware upgrades are, on the whole, minimal (and the extra bulk possibly unwelcome). Galaxy S3 owners coming to the end of a contract will be much more interested, with a massive spec bump and improved grip and durability, plus the much updated TouchWiz refinements. Five is, of course, a higher number than four, which in turn is greater than three. And, in terms of specs, the Galaxy S range runs along similar lines – the S5 is on the whole, the best device in the series yet and comes with my general recommendation. But, new applications and UI tweaks aside, is it just me who finds the annual upgrades more of a 0.1 bump than a full digit? I tested the AT&T Galaxy S5's performance, call quality, LTE performance, and camera, and got the same stellar results I saw on the T-Mobile version. LTE speeds, especially, burned up the charts. AT&T hasn't otherwise compromised the performance of this excellent phone. Of the 16GB of internal storage, 9.92GB is available to users out of the box. There are over 10 Verizon-branded apps, including Verizon Tones and the completely redundant VZ Navigator. On top of that, there are four Amazon apps, IMDb, Slacker Radio, Polaris Office 5, and Isis Wallet. None of these are removable, and Verizon also pushes its services to the forefront, making the Verizon-branded Messages+ app the default for SMS. Samsung's Galaxy S5 might be the best evidence yet that smartphone development has plateaued (Also see: Peak Smartphone Theory). The entire industry has arranged itself around a yearly upgrade cycle, but at this point, there just isn't any compelling reason for most manufacturers to release a new flagship phone. Unfortunately for Samsung, while the Galaxy S5 is a fantastic phone, all these factors mean there's nothing compelling us to run out and buy it, or recommend that anyone else does so. If you're determined to buy a top-end phone for the sake of having a top-end phone, you'll probably end up choosing the S5. If not, you could actually save quite a bit of money by stepping down a notch. Samsung's Galaxy S5 is a stellar Android smartphone. Its more refined interface, practically perfect display and improved camera make it a worthy successor to the S4. Add to that more than 8 hours of battery life and a water-resistant chassis, and the Galaxy S5 finds itself at a level occupied by few other smartphones. No question: The Galaxy S5 has some good things going for it. The phone boasts an excellent display, superb battery life and a respectable camera. It's water-resistant, too, which is a relatively unusual trait in smartphones today. But Samsung's weaknesses hold the GS5 back in some meaningful ways -- ways in which other manufacturers are currently thriving. The phone feels cheaply made, it's unnecessarily large with no accompanying benefit to the bulk and its software is cluttered and visually inconsistent. Beyond all of that, there's just nothing about the device that sets it apart or makes it feel particularly special. If the Galaxy S5 existed in a world of its own, it'd look pretty darn impressive. The problem is that the real world isn't so one-dimensional -- and when you start making comparisons, Samsung's "next big thing" looks a lot less grand. The Galaxy S5 delivers solid evolutionary changes over last year’s generation. This is the name of the game in the smartphone space now. Smartphones have become powerful enough that the days of 100% speed boost or revolutionary changes are mostly behind us and will happen at a lower frequency. At time, the design can be controversial and even polarizing, but the truth is that a single design can’t please everyone, but the good news is that there is something for everyone in this market. I was surprised that Samsung could ship something that is watertight AND removable at the same time, and overall, the phone is well-built and better than the Galaxy S4, so if you like the previous one, I suspect that you will like the S5 design better. With the Galaxy S5 arriving in the U.S. at the same time as the HTC One (M8), it's tempting to compare the two phones to each other. The Galaxy S5 is a fantastic Android phone, but it still misses the mark on some of the things that the HTC One (M8) excels at. It's not the best for blasting music, for instance, and while the TouchWiz interface has been cleaned up, it's still a step behind HTC's. While I give the edge to the HTC One (M8), they're both excellent phones and the one that's right for you will depend on what you use your phone for. Whether you like it or not, the Galaxy S5 is more than likely going to be the top-selling Android phone for the next year. Samsung has the name recognition to get non-geeks interested, and the phone doesn’t do anything to scare those folks away. For those who carefully compare smartphones to get exactly the right device, the Galaxy S5 still stands up well. I've always referred to Samsung as the iPhone of the Android world because their devices are the ones you suggest to your friends and family members who are effectively Android noobs and need a device that's easy to figure out, well-supported, and performs well. As a seasoned Android user, Samsung's Galaxy handsets continue to perplex me, but not to the point where I don't see their mass appeal. After all, it's got the latest specifications, a really stellar camera, and that bright screen coupled with a long-lasting battery that means its good for catching up on TV on the go. 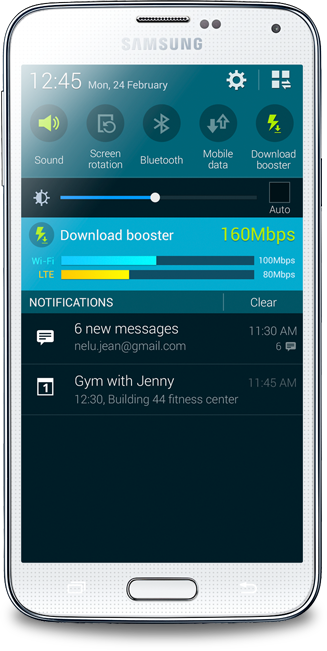 It has all of the bells and whistles a typical smartphone user would want. After its predecessor’s scattershot feature-set, the more focused approach of the S5 makes for a more confident feeling device. The camera is solid and its new UI clean, and while the heart-rate sensor takes a little getting used to for finger positioning, once you’re familiar it’s a useful addition for those who want to track basic fitness without spending on a dedicated wristband. Water-resistance is something we find ourselves wishing every phone offered. Make no mistake, this phone is going to be very popular. It has plenty of cool innovations and decent features, from the efficient fingerprint scanner to the heartbeat monitor. And more usefully it includes improved battery life, good water resistance and a better camera. The HTC One (M8) is more glamorous, the Xperia Z2 feels more solid. But this is powerful and good-looking enough to persuade Samsung loyalists and floating voters with ease. From a design point of view, little has changed since the Galaxy S4. The device looks almost identical and much like Samsung's other smartphones. See also: Samsung Galaxy S5 review: flagship has new features but doesn't stand out from the crowd. If you’re after flair in your phone however, a little bit of design panache - or an amazing camera above all else - just remember you have other options, no matter if Samsung’s inevitable marketing blitz makes it seem otherwise. The HTC One M8 is the most beautiful phone you can buy today, and nobody’s got the Lumia 1020 beat for images if you’re really prepared to dig into the settings. But hey, looks aren’t everything right? The Samsung Galaxy S5 remains king of the jacks of all trade, at least. The Samsung Galaxy S5 is probably the worst-looking of the three 2014 Android flagships we know about so far. HTC's metal One M8 and Sony's metal/glass Xperia Z2 both offer a look that is more successful than what we have here. Of course, if your phone is case-bound, the look of the hardware won't matter too much. The Samsung Galaxy S5 fits happily into the role of Galaxy S4 successor. It's a phone with some significant improvements over that model. It lacks the style of its nearest rivals, but it more than delivers on every other point and has a truly oustanding screen. One area where Samsung phones still fall short is in their construction. Although the removable plastic back makes it possible to replace the battery, it comes across as cheap next to the iPhone's glass back and the HTC One's metal body. And Samsung hasn't completely removed all the clutter. There are still two separate apps to listen to music, watch video and buy apps. The S5 comes with the standard Google apps for Android, but Samsung Electronics Co. loads its own, too. While the Samsung Galaxy S5 is not quite revolutionary and instead fixes a number of its predecessor's faults, it is still a very good smartphone. Powered by Qualcomm's latest Snapdragon 801 processor and boasting IP67 certification, the Galaxy S5 is a powerful and robust handset. The Galaxy S5's portfolio of security features, which includes a new custom fingerprint scanner and upgraded Knox 2.0 technology (where available), also make it the most business-friendly Android smartphone currently available. The Galaxy S5 represents a shift for Samsung away from throwing spaghetti at the wall to see what sticks to placing bets on fewer innovations. That strategy largely pays off with this handset. While the fingerprint reader could be more consistent, the S5 is a more refined product than the S4. We love the bright and colorful display, longer battery life and sharper camera with real-time HDR. All this goes to say why the Samsung Galaxy S5 and HTC One will share our Editors' Choice for Android smartphones for now. The Galaxy S5 triumphs on function, although its style falls a little short; the HTC One is downright gorgeous, but you make some serious compromises with its camera. Both exemplify the current state of the art. Where things get a little more interesting is with the heart rest monitor. Place your finger over the sensor on the back of the phone and you'll be given a reading. During our time with the phone it worked around 60 per cent of the time and it wasn't always accurate; at one point we were given a reading of 222bpm - we're pretty sure that's heart-attack territory. There’s plenty to brag about with the S5 - a glorious screen, superb camera, Multi Window apps, fingerprint scanning. If the tweaked build and cleaned-up user interface are anything to go by, Samsung is taking design - inside and out - seriously. And yet, while it does everything you expect from a 2014 flagship phone, it doesn’t quite go above and beyond to the same extent as the HTC One (M8), which is that little bit slicker, more stylish and joyful to live with. Das derzeit beste Smartphone am Markt? 86.98%: Esta es una buena evaluación arriba del promedio. Sin embrago, no se olvide que 10-15% de todos los modelos de portátiles obtienen una mejor evaluación.